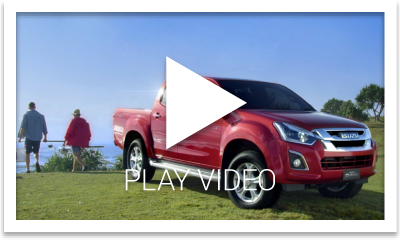 The Isuzu D-MAX is a stand out performer on or off-road. 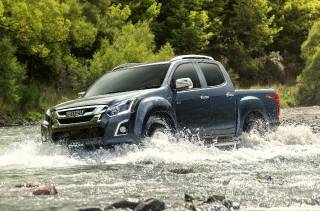 With the legendary Isuzu 3-litre turbo diesel engine, a beefed up 430Nm of torque and an intuitive 6-speed transmission, the D-MAX is all you need to pump up any adventure. 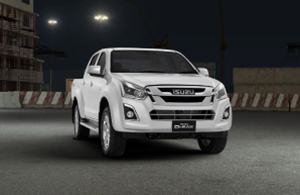 D-MAX has an exclusive Isuzu 3.0L turbo diesel engine that produces 430Nm of torque. It also uses cutting-edge technology to provide excellent fuel economy while still making plenty of power. 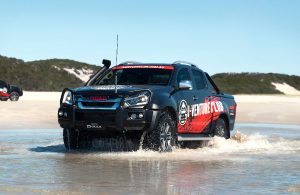 D-MAX's powerful diesel engine is built for towing. It will pull trailers, boats and caravans up hill and down the highway without breaking a sweat with a massive 3.5 tonne towing capacity+. With the 4x4 Terrain Command system and wide stance and heavy duty suspension, you can drive D-MAX into the toughest terrain. Whether you’re going off-road for work or for fun, D-MAX will get you there and beyond. Experience ultimate driving luxury with leather accented seats‡ which come standard on the top of the range LS-T models, along with a six-way adjustable electric driver seat to let you find the perfect driving position with ease. Take the road less travelled in style with the top of the range D‑MAX LS‑T. The D‑MAX LS‑T encompasses all the tough attributes you’ve come to expect from a D‑MAX with even more added luxury with these great features. A smart key offers an innovative and simple way to lock and unlock the vehicle. On the dash there's a start/stop button making starting your vehicle convenient and easy. §On 4x4 models only. Your entertainment needs are at your fingertips with SatNav, Bluetooth® audio streaming†, iPod® & USB connectivity are all included along with CD, MP3 & AM/FM Radio. You'll have eyes in the back of your head with a reversing camera - perfect for tricky parking situations, hitching a trailer or reversing out of a busy driveway. Your safety is out top priority, so the D-MAX is fitted with the latest in active and passive safety features. With a maximum 5-star safety rating on 4x4 Crew and 4x2 Crew High Ride models you can have complete peace of mind. To give you ultimate peace of mind, the D-MAX comes with our complete aftercare package, Service Plus which includes 5 year warranty^, 5 years Roadside Assistance and 5 years capped price servicing>. ‡Seats have leather touches or accents, but are not wholly leather. 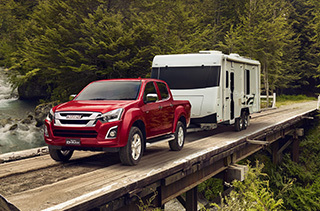 +Braked towing capacity on 4x4 and 4x2 High Ride models when fitted with an optional Genuine Isuzu UTE tow bar kit.^5 years/130,000km whichever occurs first, for eligible customers. Excludes trays and accessories. >The Capped Price Servicing Program ("CPS Program") applies to Eligible Vehicles with a Warranty Start Date on or after 1/1/15 at Participating Isuzu UTE Dealers only. The 5 years Capped Price Servicing covers the first 5 Scheduled Services for 18MY and later vehicle models for up to 5 years/75,000km (whichever occurs first) and for 16.5MY and 17MY for up to 5 years/50,000km (whichever occurs first). CPS Program is subject to change. For full terms & conditions and current pricing click here.